Moorefield senior pitcher Garett Haggerty zeroed in on the strike zone and kept the Irish off balanced during a one-hitter dethroning the top ranked defending champion Charleston Catholic with help of the defense in a 2-0 victory in the West Virginia Class A state baseball tournament semifinal at Appalachian Park in Charleston on Friday night. “To have a pitching performance just like that at the beginning, it has been working all year long so we are going to stick with it. It is easy to call pitches and the defense played great behind him. They are a great ball team. 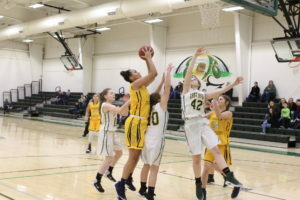 I just wanted our players to compete and that’s all I asked them to do, to compete and give 100 percent,” Moorefield coach Wade Armentrout commented. The Yellow Jackets endured a two and a half hour delay for their game due to a rain in the Class AA contest early in the afternoon, but remained calm by enjoying some ice cream during the break in the action. Moorefield took the field for batting practice and looked poise and ready for the game. Charleston Catholic pitcher Marshall Pile started off dealing three strikeouts and a walk in the opening frame to the Yellow Jackets as Brent Moran went down swinging, Grant Keller was given the free pass, then Blake Watts and Jake Ours struck out. 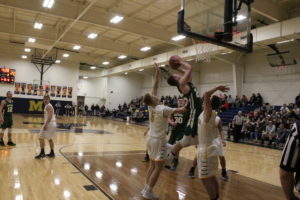 Haggerty and the Moorefield defense put the Irish down in order as sophomore second baseman Brent Moran snatched a line drive by Charleston Catholic’s Jacob Hufford, then Thomas Blaydes struck out and Dominic Martin grounded out to freshman shortstop Isaac Van Meter. In the second inning, the Yellow Jackets didn’t find the base path as freshman third baseman Hayden Baldwin flew out to Irish center fielder Timothy Kawash, Van Meter struck out and sophomore catcher Lane Ours flew out to right fielder Brendan Lanham. Charleston Catholic’s Brandon Combs was issued a full-count walk, then advanced on a sacrifice bunt by John Hufford back to Haggerty. Sean and Brendan Lanham grounded out to end the inning leaving Combs aboard. Haggerty drew a full-count walk in the top of the third inning for Moorefield, then sophomore right fielder Thomas Williams bunted into a fielder’s choice. Moran singled into right field and Williams slid into third base on an error. Moorefield junior designated hitter Grant Keller took a walk to load the bases and a timeout was called, then Pile countered with strikeouts to junior first baseman Blake Watts and senior center fielder Jake Ours to squash the threat. 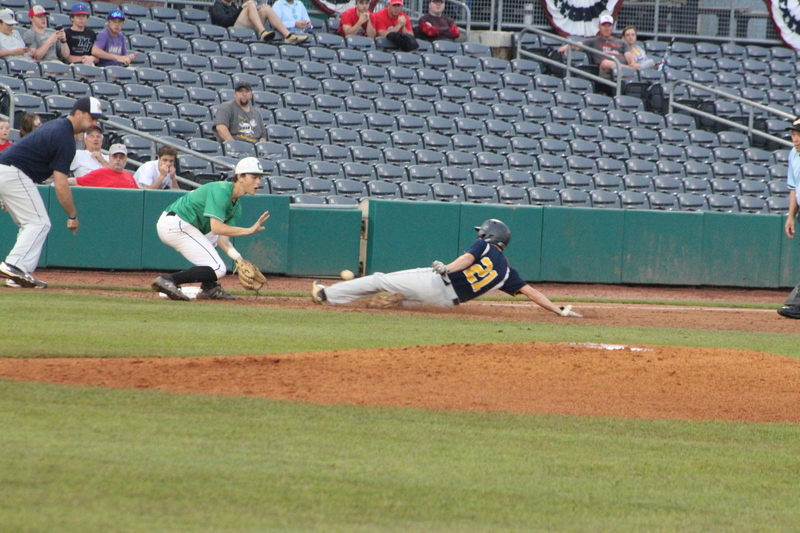 Charleston Catholic went down in order as Kawash was tagged out by Watts on the head during a bunt, then Parker Ross grounded out to Haggerty and Jacob Hufford grounded out to Baldwin. The Yellow Jackets took a 1-nil lead in the fourth inning which started with a double into left field by Baldwin. “This is great. 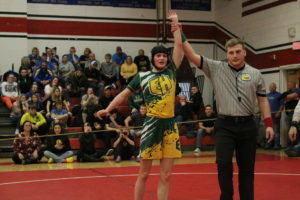 I was really feeling it with this atmosphere,” Moorefield freshman Hayden Baldwin noted. After a flyout by Van Meter, Lane Ours ripped an RBI single into left center field for the 1-0 edge.